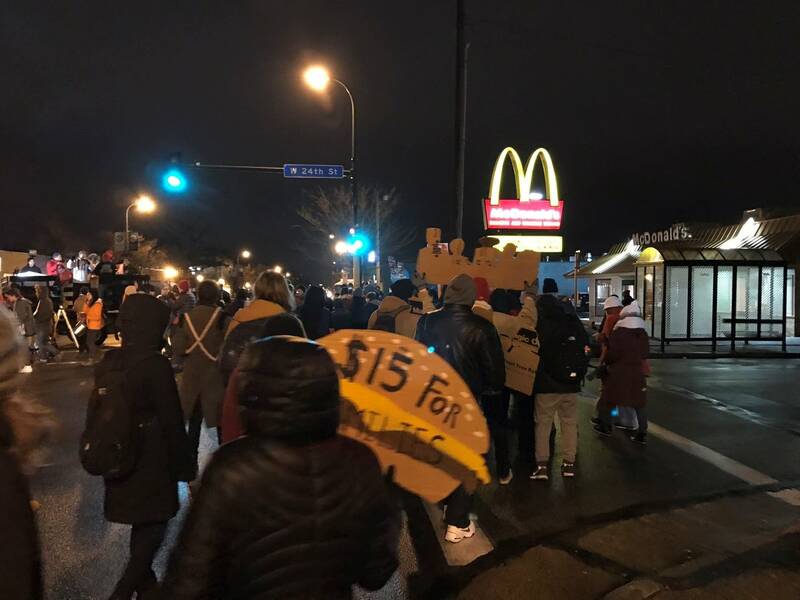 About 150 fast food workers and supporters kicked off a day of planned actions for a higher minimum wage with a rally in south Minneapolis on Tuesday morning. It's part of a national day of action that organizers say will include one-day strikes and rallies by fast food workers in hundreds of cities across the country. Lourdes Rodriguez said she makes just $10 an hour after more than a decade of working at a McDonald's in northeast Minneapolis. "The money that we make, by making poverty wages, is not always enough to cover the bills," Rodriguez said through a translator. "There are times when we have to buy very little food to be able to cover the bills, there are times when we can't even buy our children the basic things they need like clothes." 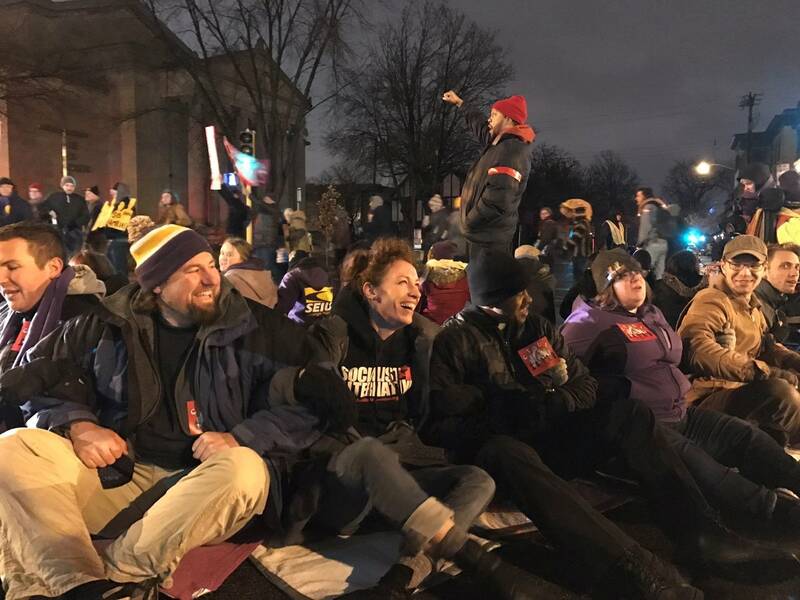 Organizers said 21 workers or supporters during the early-morning rally chose to get arrested after blocking Nicollet Avenue temporarily. Those arrested say they were ticketed and released. A number of other rallies and actions were planned across the Twin Cities throughout the day to mark the fourth anniversary of a strike by fast food workers in New York City that sparked the push for a $15 an hour minimum wage across the country. A variety of labor groups have been pushing for an increase in the minimum wage to $15 an hour in cities across the country including Minneapolis. The groups have vowed to fight on despite a Minnesota Supreme Court ruling earlier this year that blocked a minimum wage increase from the ballot in Minneapolis. Debra Howze, a home health care worker represented by the Service Employees International Union (SEIU), said it's hard to make ends meet on her $12.95 hourly wage. "Do the math, on your rent, on your bills, on your food, on your clothing, on your gas, on your insurance you've got to have," Howze said. "Do the math, it does not add up." State Rep. Frank Hornstein of Minneapolis said at the morning rally that results of the recent national elections made it all the more important for cities and states to step up on issues like a higher minimum wage. "We have to build a strong movement, a strong effort to say that just because of a national election, these issues don't go away," Hornstein said. "In fact, we have to be even more determined and more clear about what our vision is." The labor groups plan to rally on Tuesday afternoon at Minneapolis-St. Paul International Airport, where 600 workers including some baggage handlers and cart drivers recently voted to unionize. What organizers are calling the "day of disruption" will end with a march this evening through the University of Minnesota's campus in Minneapolis followed by a rally at a McDonald's in the city's Dinkytown neighborhood.